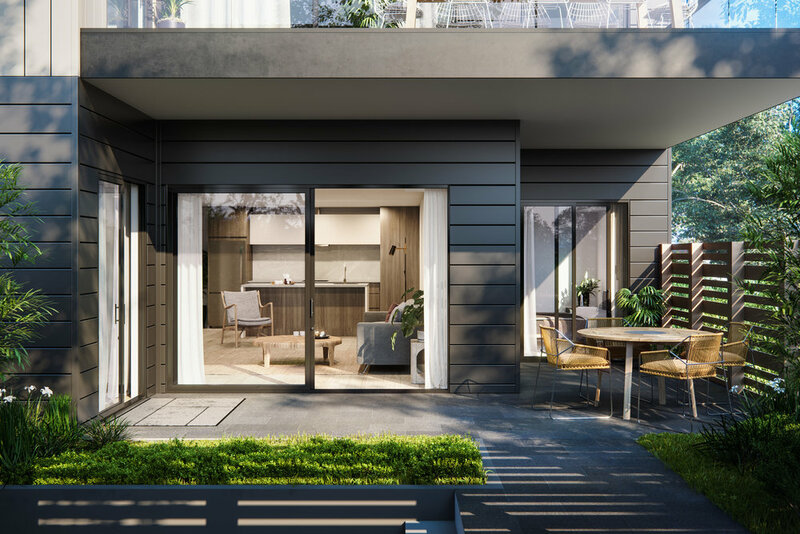 Inspired by leading-edge global modernist designs, On Kaipiho Lane Albany (O.K.L.A.) 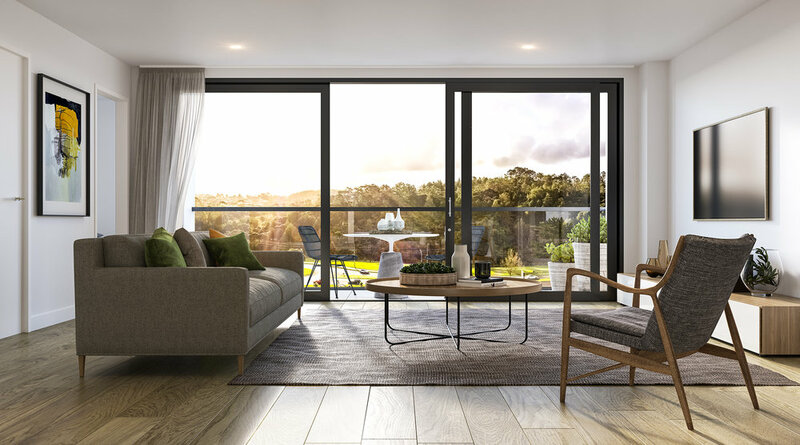 is a statement building which offers luxurious living in Auckland’s fastest growing suburb. ON KAIPIHO LANE ALBANY – O.K.L.A. Located in the heart of Albany, O.K.L.A. comprises 117 one, two and three-bedroom high-end apartments in an area which is experiencing phenomenal growth. The striking six-level building also includes two retail/café tenancies at ground level. The development is located with easy access to public transport and an array of amenities, which include two major retail hubs. Ignite’s specialist residential team have designed a unique V-Shaped building which achieves the client’s vision of ‘everyday luxury’. The aesthetic is honest, functional and timeless, offering light-filled spaces across all levels. Each unit has been designed to bring the outside in. Ground floor apartments feature expansive courtyards, while the upper level units offer spacious balconies. The building form reflects a simple and dynamic expression. This is formed through a column and beam system using concrete and steel. The exterior cladding materials, of terracotta tiles and patterned concrete panels, add contrast and express a lighter typology. A mix of cantilevered and recessed balconies are used to articulate the external façade. The use of distinct architectural geometry provides O.K.L.A. with a strong individual character. Residents and visitors are welcomed into an entry lobby, which establishes a desirable residential identity for the building. Contemporary and double height, it is framed by a unique feature wall of perforated themed metal. The two retail/café tenancies flank each corner of the lobby. The larger space is situated on the north-east corner of the building and forms a light-filled plaza. The smaller space is located at street level. The main entry leads onto a second, secure lobby area for residents, which provides the practical benefit of highlighting the centralised lift core. The ground floor apartments in O.K.L.A. allow seamless indoor-outdoor flow, with secure and private walk-up access from common areas. Courtyards have a sunny north-east aspect designed with privacy in mind, letting residents enjoy their own private garden oasis. All apartments feature modern open-planned living areas. These are complemented by clever storage solutions and flexible spaces that can be used as study, media or guest rooms. Kitchens are equipped with engineered stone benches and splashbacks. Considered bedroom designs create peaceful and inviting environments. All apartments feature built-in wardrobes and some extend to luxury ensuites. Residents have the choice of two finishes – neutral or high contrast. This colour palette, along with textured elements, ensures these are warm, comfortable and contemporary interior spaces. Each apartment reflects a focus on quality fixtures and materials, along with well-designed construction details.